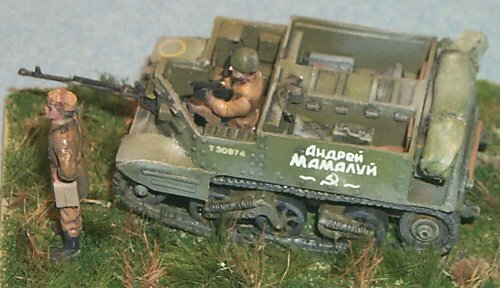 This is originally the WASP SP flamethrower kit that I converted to a scout vehicle in USSR service. The main weapon is a LEVA resin AT rifle from their Soviet Infantry Assessories. 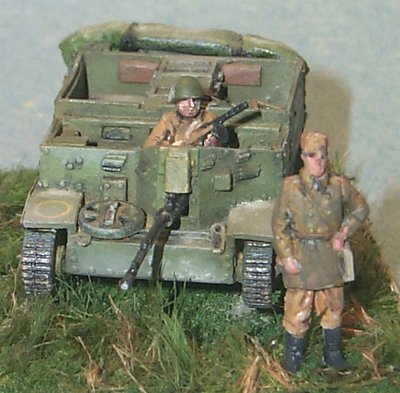 The seated figure is from the ESCI T-34, the standing figure is from Milicast Soviet resin tank crew. Lots of LEVA ammo boxes are piled in the rear to disguise the lack of floorspace below the seating area. Overall a decent kit but it suffers from a bow that is too short (in comparing to full-scale vehicle, note how it is too short for the spare wheel storage). The tracks are cast in one piece like Airfix's Universal Carrier with the same problem that the tracks are too thick and lack guide teeth.